On the final day of October we had the John Lucas (2nd from right) crew out for a day of rockfish chumming and trolling, followed by deep trolling for seatrout. 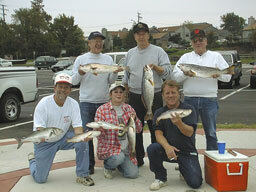 Here we have more of John's crew with part of their catch of seatrout, including Pat's 25 inch beauty. 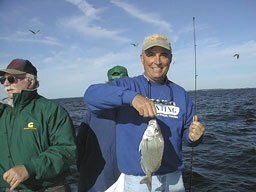 And here's Bernie Long with a black seabass which he caught October 30 while deep trolling for seatrout. 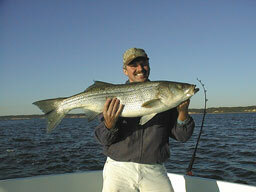 Bernie and crew also caught limits of rockfish and some nice trout. On October 29 Captain Drew took a bunch of folks on a dinner cruise across the Bay to Harrison's on Tilghman's Island. 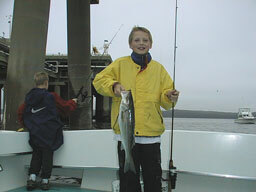 Here we have young Josh of the Sagan crew from October 24 with a couple nice seatrout. 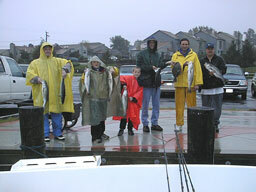 Despite the downpour of October 17, the Dwayne Haines (2nd from right) party had a good time riding the "Worm" and catching limits of rockfish while chumming, a few flounder while bottom fishing, and some nice seatrout and bluefish trolling the deep. 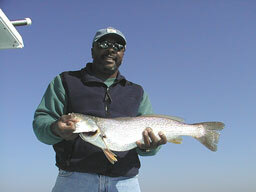 Here's Dwayne with a super 24 inch yellowfin trout, biggest of the day. 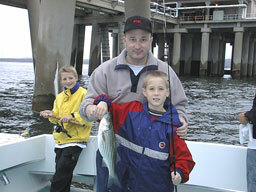 Among the Haines crew, here we have young Kevin and his dad with a plump 20 inch striper. That's Eric in the background, waiting for a visit from Mr. Rockfish. Now it's Eric's turn in front of the camera with a nice 22 inch rockfish. 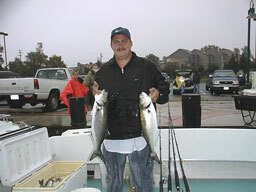 Not to be outdone, Chris ended our day with a double on 5 pound bluefish that took our trout baits. The Mark Heintzelman (center, standing) crew of October 15 is shown here with some of their limits of rockfish and some nice seatrout to 24 inches. 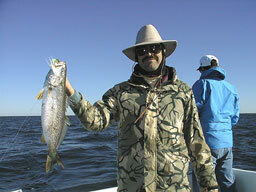 A few nice bluefish were also caught while trolling for trout. Here's a closeup of a real nice 24 inch yellowfin, which took a small white bucktail. The Breezy Point Fishing Center Fall Tournament was held over the weekend of October 9-10. 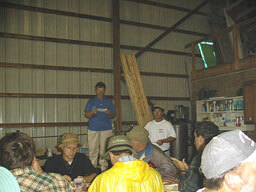 While Sunday's weather was windy and rainy, a good time was had by all who participated in the two day event. Here we have Miss Kitty awarding Captain Drew first place for the largest seatrout on Saturday (6.3 pounds) and again on Sunday (2.1 pounds). 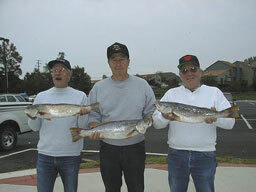 Here we have Saturday's tournament crew with their catch of seatrout, two of which were over 6 pounds. From left to right, that's George, Jim, Bud (standing), Bobby, Cindy and Danny (kneeling). 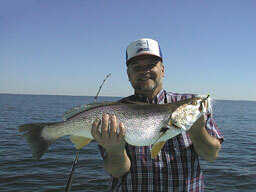 Here's a closeup of some fine trout, all of which were caught while trolling small bucktails. 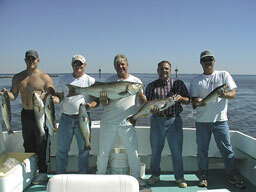 Here we have the Randy Eckley crew of October 8 from Green Construction Co., lined up along the chum slick. From left to right, that's our Captain Drew facing away, then Tom, Dave, Kevin, Bob, and Randy. We'll have to include this one in the "most unusual" catch category. That's a porgy ( or scup as they say up north) which was caught in the chum slick among a bunch of small rockfish and blues on October 8 near the Stone. Here's a member of the Jeff Wallace crew of October 6 with another fine seatrout, this one stretching the tape to 25 inches. 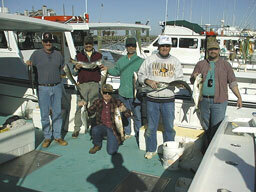 Limits of rockfish and some blues were chummed up as well. Wow! Although we're not much on photos of fish-filled coolers, this is one nice pile of seatrout. After catching limits of small rockfish while chumming near Sharps Island Light, the Ed Smith crew of October 3 went after these trout and had a blast. Here's Ed Smith and daughter Christine with one of her rockfish, a plump 20 incher. Although the old timers would be unimpressed with a 27 inch yellowfin trout (weakfish), this one certainly caught our attention after it fell for a small white bucktail. 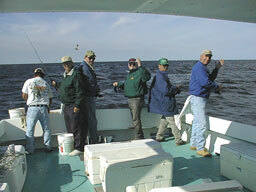 Here's the entire Ed Smith crew fishing the chum slick. 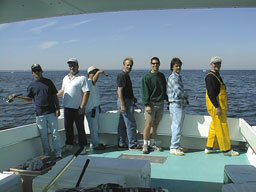 And here we have the Mike Fox (center) crew of October 2, waiting for rockfish to find the chum. 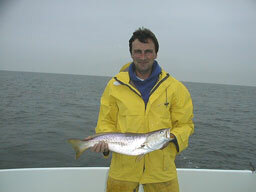 Mike and friends also caught a nice bunch of bluefish to 6 pounds not far from the Stone and some nice seatrout as well. The Mike Easterday (second from left) had a great day on the Bay on October 1, catching rockfish to 37 inches and seatrout to 27 inches. Here's a closeup of another magnificent seatrout. While there aren't many rockfish this size around our part of the Bay at this time of year, this fish put a smile on this member of the Easterday crew.